Recently when i was looking for new liners and mascaras i came across Niju Girl's liner and mascara on nailsandbeauty.in , the consistency of these is unlike other liner and mascaras i have used. Today i would be talking about the goods and bads of the Niju Girl Black Cats Eyeliner. The packaging of these liner (and mascara) is really cute and girly with pink and white lace design, the bottle of the liner is also very cute with long handle and a felt tip brush. 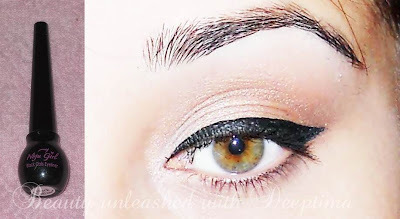 The consistency of the liner is not watery but its not dry either. The long handle provides more control and grip even a beginner can use it with ease. Here is the proof that it can survive rain , tears and sweat. I rubbed the liner with dry finger but it stayed in place then i placed my hand under water tab for the water test and then i pat it dry you can see in the picture it stayed in place. But its really easy to remove just use a lotion OR makeup remover. I am quite happy with the liner as the staying power is really good , it doesn't bleed or smudge in the heat and sweat and the bottle is cute and makes the application easy and quick. Little disappointed as the quantity is less and its made in Korea, that means it might not be a cruelty free product. Disclaimer : Product sent for review, am not affiliated with the brand or website and am not being paid for this post. 100% honest opinion. i was looking for a jet black liner. I am tired of using the indian options lakme,colorbar etc. This seems exciting!